If you’re craving a holiday with a difference – experience ancient cultural heritage of Nepal. Heritage hotels in Nepal, each a gem in its own right, promise holiday experiences. Built upon a rich tradition of Nepali hospitality and incorporating some of the country’s most exquisite architectural traditions, heritage hotels in Kathmandu are an authentic experience of Nepal’s ancient cultural heritage. The spacious rooms, elegant setting and Nepali warmth make it a luxurious retreat and an experience to treasure. The Dwarikas Hotel Kathmandu is a boutique heritage property that is a tribute to the architectural craftsmanship of Kathmandu. The carved wooden pillars, doorways, and window-frames on the hotel’s exterior facades and courtyards date from the 13th century to the 18th century. Beginning in the late 1950s , the wooden carvings were rescued by the late Mr. dwarika das shrestha from across the Kathmandu valley, before they were destroyed as firewood, as was occurring across the city. the hotel is most commonly described by guests as a “living Museum”. Hotel Shanker is a 100-year-old neo-classical style palace situated in the heart of Kathmandu. it faces the north side of the Royal Palace, and is just a 5-minute walk from Thamel, the pulse of the city. It is truly a “Heritage Hotel with a History!” this palatial hotel, once owned by the grandfather of Her Majesty late Queen Aishwarya and Her Majesty former Queen Komal, is characterized by exquisite and authentic objects d’art that enhance the beauty of the existing interior. Yak & Yeti Hotel is a luxury 5-star deluxe hotel in Durbar Marg, the heart of Kathmandu, Nepal. Modern day sophistication greets cultural heritage in the ample grounds of the 100-year-old palace and newly designed structure of the hotel. Find refuge among antique fountains, gilded temples, and emerald gardens, as you remain just moments away from all the shops and adventure of Kathmandu city. enjoy the many excellent facilities available for a most comfortable stay in Kathmandu, and taste the many delicacies prepared by its experienced chefs. Hotel Vajra Guest House is built in the typical Nepali pagoda style, jeweled inside and out with wood and terracotta carvings, stone and marble tiles, hanging brick gardens, and traditional Tibetan ceiling-paintings. Guests can enjoy an art gallery, a classical dance studio with weekly performances, an East-West library, an Ayurveda massage room, the Pagoda Bar, the Pagoda Hall for meditation or yoga, the Naga Theater with yearly drama performances by Studio 7, and a cluster of ﬂower trailed gardens.The rooftop gardens give magnificent morning and sunset panoramas of Durbar Square’s pagodas, as well as of the 2000-year-old Swoyambhunath. Located in a quiet place in Thamel, it is about 20 minutes drive from the international airport, and close to the city’s shopping streets and cultural sights. While its rooftop offers spectacular views of Kathmandu valley and surrounding mountains, its comfortable rooms, a lovely water pool, and landscaped garden provide peace and relaxation. the Wild Ginger Restaurant with open kitchen serves hearty and hygienic food, and the Library Bar offers a selection of popular drinks. Kathmandu Guest House (est. 1967) is the flagship hotel of KGH group. Located in the middle of the tourist district Thamel, it is an iconic hotel that has evolved from a budget to a 99-room boutique hotel today. this famous hotel has hosted international celebrities like Ricky Martin and Jeremy Irons, along with many well-known mountaineers who have conquered the highest Himalayan peaks. the hotel boasts its own “walk of fame” with names of many prominent personalities. this recently renovated hotel is best known for its “dream Garden” which is acclaimed to be an oasis in the midst of the hustle and bustle of Thamel. 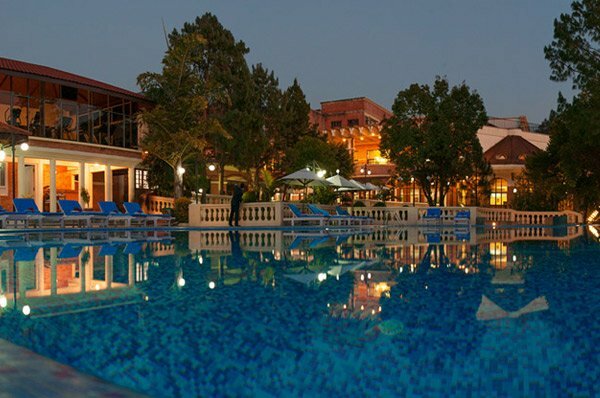 Hotel Mountain Heritage is conveniently located at the central lakeside almost 100 meters. We are 50 meters off the main road meaning we are close to everything in Lake Side while being far enough off the street for more peaceful sleep. To find us turn up the street(away from Fewa Lake) at 7/11 restaurant near Nabil Bank Ltd.Hotel Mountain Heritage offers quiet,clean and comfortable rooms with beautiful view of Annapurna range and Fewa Lake view. Our restaurant serves breakfast, lunch and dinner of variety of food and meals. Hotel Mountain Heritage can help you line of fantastic package of: Paragliding, Trekking, Rafting, Zip-lining and local sightseeing. We can assure you will have a great holiday in Pokhara. Hotel Heritage is the first deluxe hotel built in Bhaktapur, a UNESCO world heritage site. It is a boutique hotel which successfully blends traditional Nepali look and feel with modern amenities. The hotel is located a short 7-minute walk from Bhaktapur Durbar Square. History comes alive in this establishment where Malla, Rana, Newari and Mithila influences, as well as Hindu and Buddhist traditions all blend effortlessly to create a tasteful, cozy and unique hideaway. Every part of the hotel has an intriguing story to tell. Hotel Manaslu located in the immaculate area of Lazimpat, Kathmandu is a heritage hotel established in 1972. Hotel Manaslu is one the most reputed hotels in Kathmandu and has proudly built its reputation in hospitality and service throughout its 46 years of operation. Hotel Manaslu has kept the proud heritage of Nepal alive throughout its operation by offering unparalleled service and warm hospitality, that defines the values and culture of Nepal its population. Hotel Manaslu, Lazimpat takes pride in the renowned craftsmanship of Nepali artisans and portrays the splendid examples of their craft in the hotel buildings and architecture. The architecture of the Manaslu hotel includes many ancient pieces that have been carefully restored and incorporated as a symbol of pride upon the beautiful heritage of Nepal. Hotel Manaslu, the premier heritage hotel in Kathmandu offers an intimate experience of Nepal’s art and culture in the truest sense. Hotel Manaslu provides very reasonable rate compared to the hospitality service it provides.